Waterless printing is a better way to print. It doesn't use the water or other chemicals necessary to make conventional printing work. It is easier to manage meaning faster production and better quality. Lower paper usage means less energy used to recycle waste. No water or chemical usage means less air pollution caused by evaporation and less energy used for cleaning contaminated water. Lower environmental impact means you can feel good about using print to communicate with your customers. 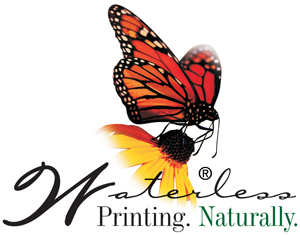 For more information about the waterless printing process, please visit www.waterless.org.